The first time I came to this city I didn’t understand it. I came in summer with my good friend as we were travelling around Europe during our University break. We stayed in a typical ugly grey hostel at the back of the city and it was miserable weather, raining non stop for the few days that we were there for. Even though we walked around all the main landmarks I couldn’t see the city for what it really was. As we were on our way to the airport after those couple of days, for some reason, perhaps destiny, we missed our flight to Greece. I remember thinking I definitely don’t want to return to that grey hostel! Luckily my partner Antonio (Back then he was just a friend) was staying with his family for a few weeks (they are from the north of Milan, just outside the city) and so he picked us up from the airport and invited us to stay at his home. As we were driving from the airport the three of us decided to go to Lake Como. The sun was shining that day and we drove all around the lake through the cute little Italian villages, scattered around the beautiful emerald green lake. That moment, was when I began to like the Northern Part of Italy. I suppose it’s because I had expectations of picturesque Italian towns and Milan, well, it’s completely not that (on the surface). The second time I came to this city was completely last minute. Flying in to spend Christmas with Antonio and his family I actually didn’t even visit the city centre this second time. Staying outside of Milan, I didn’t feel the need to see it again since my last visit was slightly underwhelming, I was shown the smaller towns outside of the big city. It was so fascinating to experience, especially during Christmas time. The third time I came to the city was when I began to understand and enjoy Milan. Perhaps I was too young before and didn’t really see it for what it was, however now every time I come to Milan and visit the centre, my eyes are hungry for its beautiful architecture and cosmopolitan Italian feel. 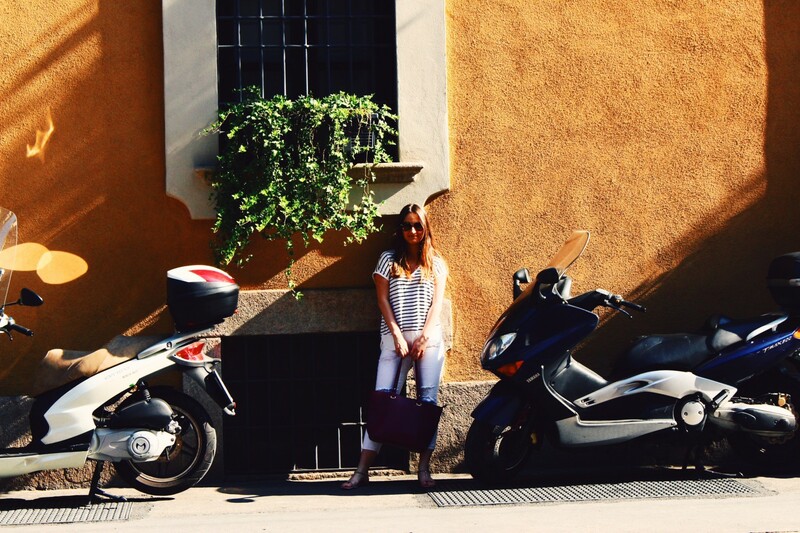 I am drawn to walk around the city, exploring and watching all the Milanese around me. The streets are filled with this energy that’s hard to explain, but hopefully my pictures below can show it. I really, really love it. This year I spent the end of summer and beginning of autumn in Milan. The change of seasons in a city like Milan is beautiful…and you get to enjoy all the autumn produce like freshly ripe figs and delicious toasted chestnuts! Below is what I would recommend to do and where to eat. Walk through Galleria Vittorio Emanuele. A Stunning shopping mall that is one of the oldest in the world! You don’t even need to go shopping there, it’s just absolutely extraordinary. There is also a really nice bookshop there and Pasticceria Marchesi. Make sure you walk through it during the day and at night. Once you finish walking through and exploring Galleria Vittorio Emanuele continue towards the Duomo Di Milano. This is the heart of the city and where the Cathedral of Milan is located. It always catches my breathe. You can just walk around it and in front of it, however if you would like, you can actually climb the steps to the very top. I’ve done this once before and really recommend it! You get to see the Gothic architecture of the Cathedral up close in more detail AND the views from there are stunning! Teatro alla Scala – if you can, definitely try come here! Great place to go at night if you’re in the mood for some theatre, but make sure you book in advance. Visit the Navigli District during aperitivo time (You can walk there from the city centre and just enjoy the stroll, its fascinating walking past all the shops and cafes). The Navigli district is where everyone goes in the evenings. Beautiful during the sunset, enjoying a Negroni or Aperol spritz. This district is made up of 5 canals and the main one has a really good mix of bars and restaurants. More information below. Visit Castello Sforezsco. You can walk around the grounds of the castle and there are also numerous exhibitions that take place there. Visit the Bulgari Hotel if you love interior design. It’s stunning! If you can stay there, even better. Visit the district of Brera (located just between and to the side of the Duomo and Castle). It has a bohemian atmosphere, and great for visiting boutiques and art galleries. Visit Pinacoteca di Brera (one of the main galleries in Brera). Not only is the historical architecture of the building a great reason to visit, but it also contains some of Italy’s most known art masterpieces. Visiting this gallery a few years ago, completely made me fall in love with this whole district! I highly recommend to take a day trip to Monza. The best time to visit Monza is in the afternoon. Starting with a trip to the recently refurbished Royal Villa of Monza (Villa Reale), followed by a walk through the main streets in the centre. You can visit the Duomo di Monza, and also Arengario (A medieval landmark) located right in the centre square, if you go upstairs you will most likely find an art exhibition. Just next to Arengario there is a gorgeous pasticceria (Moderno Confetteria & Gastronomia). If you come during Christmas, there are market stalls on the weekend selling regional and artisanal products. Get a rental car and drive to Lake Como. There you have many different options to visit various cute towns located all around the lake. I would recommend a couple, including the infamous town of Bellagio and then Mandello del Lario is also a must! Walk around, get lost, explore the small churches, eat at the restaurants, drink coffee, finish of with a gelato looking at the Lake and its mesmerising colour. This is a Bakery in the north and just outside of Milan (if you’re driving around in the north you must visit this bakery). They make artisanal bread and other italian baked goods, supplying to all major hotels in Milan. This family business have mastered bread making and you can visit their bakery and be tempted to buy all the baked goodies that they have in the front…fresh pizzas, pastries, breads, absolutely everything is delicious. The head baker is incredibly passionate and we were lucky to interview him and his brother about baking bread. We cannot recommend this place more! They are always investigating the best quality flour, preferring to use unrefined flours that come from ancient wheat varieties, full of nutrients unlike conventional flour that is stripped from all nutrients. I will be posting our interview with him in more detail so stay tuned! This incredibly stylish pasticceria is right inside Galleria Vittorio Emanuele. Pasticceria Marchesi was established in 1824 and is one of oldest pastry shops in Milan, this premises is their latest addition. Perfect for a coffee break when you’re exploring the city centre of Milan, its quiet and a stylish pasticceria with luxe green interiors, arched windows looking over the Galleria Vittorio Emanuele. Visit their website (linked above) for the other locations of their stores. If you go to Monza make sure you stop by this Gastronomic cafe and shop. Full of Italian products, seriously good espresso, confetti, cakes, pastries and more! It’s really gorgeous inside and right in the centre of Monza so you can’t miss it! I think many people have heard of Eataly by now, however if you haven’t I really recommend visiting this place. They are located all over Italy and also in the US and basically sell all Italian regional products. It’s great to come here and just explore the different levels and different sections, like the pasta section, prosicutto and salumi section, and more. If you are looking for a place that serves awesome food and has a great bar too then this place is it. I came here for aperitivo and it was amazing. The whole bar had platters and bowls of amazing Italian snacks and aperitivo food. They had huge platters of mini fresh pizza, bowls of capsicum and other vegetables, olives, salami and prosciutto boards and so much more! Plus the Prosecco we had was delicious and went very well with the bar food. The ambience is great and so is the music! It’s also less touristy as it’s located in a suburb that is more for University students, young professionals and families, known as the Island Quarter or in Italian Quartiere Isola. There are lots of great restaurants around too, like the one below in this list (just around the corner). If you feel like seafood in Milan, then this is a great seafood trattoria. Bringing Puglia to the streets of Milan, they serve simple and delicious dishes. We had the Mussels in a white wine sauce, the tuna carpaccio and the grilled prawns. Super simple but very fresh and full of flavour, this place is perfect for a seafood feast with a group of friends. This restaurant gets packed with locals (Even on a week night) so make sure you book! Its also located in the Island Quarter. Right next to the duomo there is a shopping mall called La Rinascente. On the very top level you will find a food hub with a mozzarella bar, espresso bar, oyster bar and if you walk through to the terrace, there are two bars that serve typical Italian aperitivo. Enjoy an Aperol spritz and bar snacks right next to the duomo as the sun sets amongst a mix of tourists and local Milanese. I’ve put down the general Navigli district because I think it’s too hard to choose just one place here. If you do visit Navigli, then it’s best to do so in the evening from 5pm onwards. Thats aperitivo time and when the main canal gets really busy. All the bars and restaurants open and start serving aperitivo. A great place to start your evening and also I believe it’s definitely the most picturesque at this time. Especially when the sun begins to set and the colours of the buildings are at their best in that Golden hour time.